LUTHERVILLE, Md. 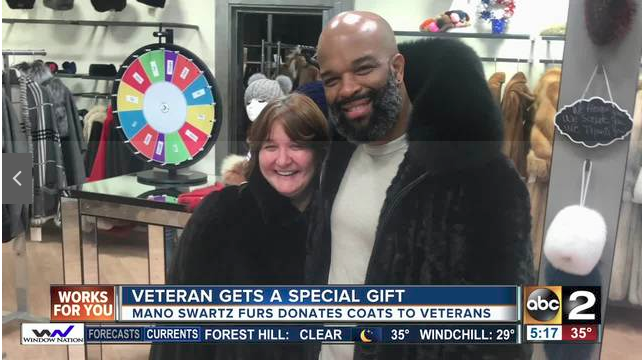 (WMAR) – Denise Reccardi was told to come to Mano Swartz today to receive a surprise. Richard Swartz, the owner of Mano Swartz, presented Denise with a bunch of thank you letters. Being a veteran, of course, she deserves our thanks. Especially because during the more than 25 years of service as a medic nurse she was injured. Her chopper went down and she suffered significant injuries. After completing a long and painful series of rehabilitation for her war injuries, Denise was diagnosed with breast cancer and went through treatments. Richard Swartz wanted to do more than just thank you letters. Richard presented Denise with a new mink coat, a 3/4 length black sheared mink coat. The value of this is $8,000. That’s enough to leave anyone speechless. The tradition of taking care of veterans goes back to Richard’s great-grandfather and Richard says he doesn’t have any plans to change that anytime soon.